Armyman Vijay Kumar turned out to be the unlikely hero. He lifted sagging Indian spirits by clinching the silver medal after fighting a nerve-wracking battle with five other top marksmen in the men's 25m Rapid Fire Pistol at the Olympic Games on Friday. The 26-year-old army subedar, belonging to the 16th Dogra Regiment, displayed ice cool temperament in the 40-shot final to finish runner-up, behind gold medal winner Leuris Pupo of Cuba, and provide a silver lining to India's stuttering campaign . 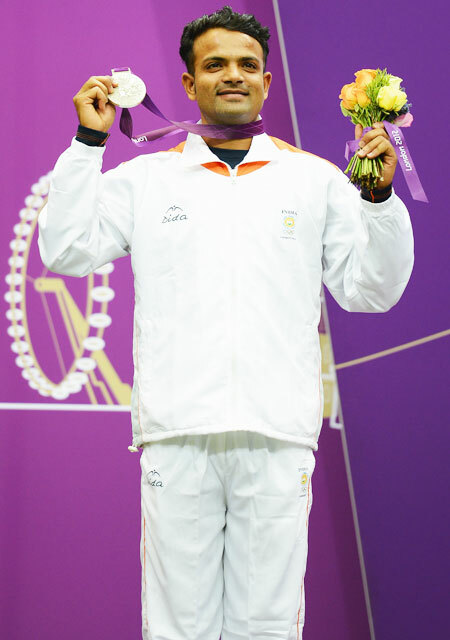 Kumar is second Indian medal winner at London Games after fellow-marksman Gagan Narang. He is the fourth Indian shooter to win a medal at the Olympics, following in the footsteps of Rajyavardhan Singh Rathore (silver in 2004 Athens), Abhinav Bindra (gold in 2008 Beijing) and Narang. 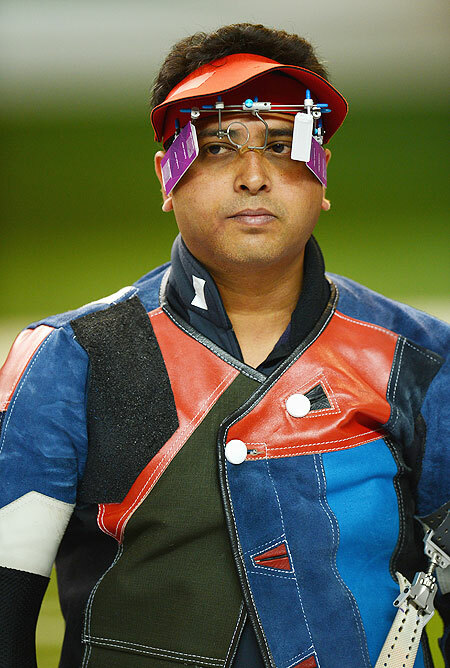 Apart from Kumar, another shooter, Joydeep Karmakar, narrowly missed out on a bronze medal in the 50m rifle prone event after setting an Olympic record in the qualifying stage. Karmakar put his best foot forward but could only finish fourth with a tally of 699.1, which was just 1.9 adrift of bronze medal winner's score of 701.0. 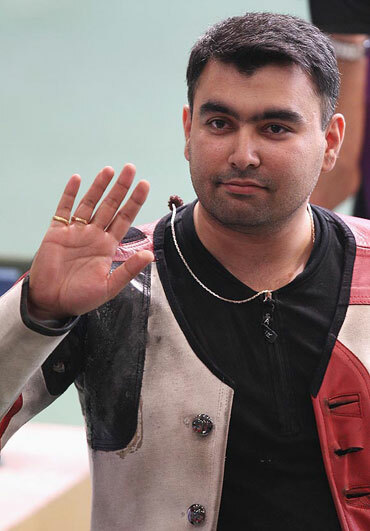 After scoring 595 out of 600 and then qualifying for the final through a shoot-off with eight others, who were all tied in fourth place, the 32-year-old Kolkata man shot consistently well, but still finished outside the medal bracket. The one point difference that Karmakar conceded to eventual bronze medallist Rajmond Debevec of Slovenia proved to be decisive in the battle for third place. 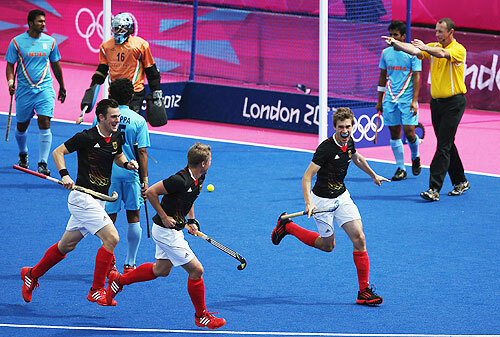 In men's hockey, India went out of contention for a semi-final place after being routed 5-2 by Germany in Group B, their third successive defeat in the six-team pool. Young striker Florian Fuchs (7th minute, 16th, and 36th) scored a brilliant hat-trick for the Germans, while Oliver Korn (24th) and Christopher Wesley (33rd) were the other goal-getters for the European giants. For India, VR Raghunath (13th) and Tushar Khandker (62nd) reduced the margin of defeat. The morning, however, ended in disappointment for the hopes of the millions of Indian sports fans when Saina was outclassed in two straight games by World No. 1 and top seed Yihan Wang of China in the semi-finals. However, the star Indian shuttler, the fourth seed and World No. 5, still has a chance to clinch the bronze when she takes on Yihan's compatriot Xin Wang, the World No. 2, on Saturday in the play-off. The 22-year-old Indian, who became the first Indian to reach the semi-finals of an Olympic badminton event, won 13 points in each of the two games of the match which lasted 42 minutes. In boxing, Vijender Singh inched closer to an unprecedented second successive Olympic medal by entering the middleweight (75kg) quarter-finals with a thrilling one-point triumph over American Terrell Gausha on Thursday night. The 26-year-old Indian, a bronze-medallist at the Beijing Olympic Games, is just one win away from being assured of another medal at the big event. In a thrilling contest, he scraped past Gausha 16-15. Narang, however, failed to repeat his bronze medal-winning display earlier in the Games and could not advance to the final of the men's 50m prone event. Narang, who just four days ago became the country's first medal winner at the Games, could fire just 593 out of 600 and finished a shocking 18th in a field of 50 competitors. Meanwhile, India's campaign in athletics commenced on a poor note, with shot putter Om Prakash Karhana and triple jumper Mayookha Johnny both failing to qualify for the final rounds. Om Prakash ended up 19th with a below par effort of 19.86m, while Mayookha too disappointed with a leap of 13.77m while finishing 22nd. India's lone participant in swimming, Gagan Ullalmath finished last in the men's 1,500m freestyle heats. In the seven-man heat number one, he timed 16:31.14secs, which was the worst timing among the 31 swimmers who participated in the four heats of the event. The 20-year-old from Bangalore had qualified for the Olympics under FINA's strange "universality" clause while four of the country's more fancied swimmers had failed to make it to the Games. 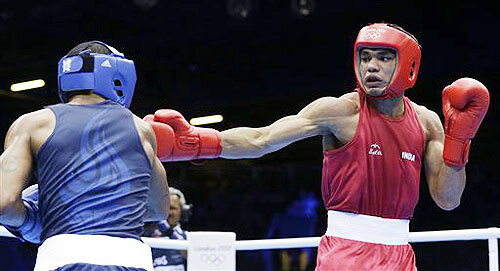 Boxer Vikas Krishan got the better of Errol Spence of the United States 13-11 and entered the quarter-finals in the 69kgs weight category. Krishan took first round 4-2, while Spence claimed the next 6-5. 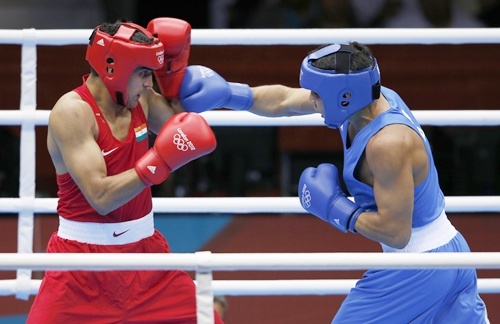 In the final round, the Indian boxer went on the offensive to score early and emerge a clear winner. Vikas Krishan will face Andrey Zamkovoy of Russia on August 7.